Socrates and Dionysus engages and seeks to redraw the boundaries between philosophy and poetry, science and art. 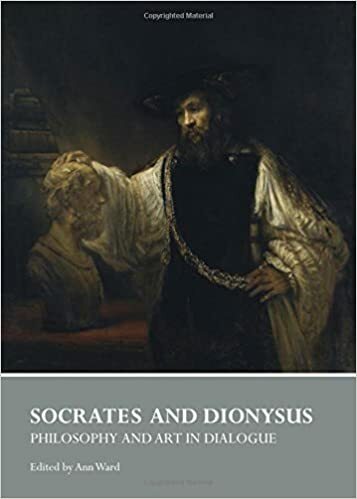 Friedrich Nietzsche argues in his work The Birth of Tragedy that science conquers art, especially the tragic art of the Dionysian poet of ancient Greece. Appealing to the natural, primeval self that is suppressed but not extinguished by the knowledge of culture, Dionysian tragedy establishes contact with our bodies and their deepest longings. Science and philosophy, associated with the 'Socratism' of the theoretical man, celebrate the human mind in particular and the mind or rationality of the universe more generally. According to Nietzsche, it is Euripides who destroys the Dionysian entirely. Euripides celebrated the unadorned individual because only the individual, separated from their god, is intelligible or accessible to human reason; he insisted that art be comprehended by mind or that it be rationally understood. Euripides was possessed of such a rationalizing drive, Nietzsche claims, because his primary audience was Socrates. It is Socrates, therefore, who is the true opponent of Dionysus. Following Nietzsche's bifurcation between philosophy and art, postmodern political philosopher Richard Rorty rejects the tendency of philosophy to posit absolute, universal truths and turns to the concept of 'redescription' which he associates with the 'wisdom of the novel'. The novel is wise because it posits the relative truths and perspectives of the various individuals, societies and cultures that it represents. As an art form, it can therefore include every possible perspective of every particular situation, event or person. New interdisciplinary fields in politics, literature and film are giving rise to an expanding community of scholars who disagree with the approaches taken by Nietzsche and Rorty. These scholars are shedding light on the ways in which philosophy and art are friends rather than enemies. They seek to bridge the theoretical and ethical gaps between the world of 'fiction' and the world of 'fact', of art and science. There appears to be a fundamental tension between literary-artistic and scientific projects. Whereas the artist seeks to recreate human experience, thereby evoking basic ethical issues, the scientist apparently seeks ethically-neutral, evidence-based facts as the constituents of our knowledge of reality. Chapters in this volume, however, will reconsider how artists, philosophers and film-makers have addressed and attempted to reconcile the artist's language of normativity and the scientist's language of facticity.